Streams of the River: London riots . . . the bishops respond . . .
"These events cannot be allowed to define the Tottenham we know and love. "Many of us have worked in this community for many years and we know the loving, generous and openhearted people with whom we share our daily lives are not the rioters who have destroyed so much. "What has happened will not conquer the hope which is set before us. We will continue to share that hope with our neighbours and friends as we move to rebuild in Tottenham. "Our hearts and prayers go out to all those affected, including those who have been made homeless and local business owners whose livelihoods have been threatened. "Together, our churches already run a multitude of activities supporting all members of the community, irrespective of their faith, and these efforts will be continued and where possible extended." ". . . It is obviously vital not to stigmatise a whole generation. There are huge numbers of hopeful and high achieving young people in London but we do have a problem with a minority. Behind the opportunists who joined in the disturbances there is the reality of a criminal gang culture. "One of the difficulties for the police has been dealing with street violence, while under the cover of the disturbances and the arson, which could so easily have cost lives, highly mobile groups of looters have been on the rampage. "What has occurred should be condemned unequivocally and as the first of those arrested appear before magistrates and as stolen property is already being recovered, it is right to pay tribute to the bravery of the police who have regained control of our streets. "I am also immensely proud of the response of the church. 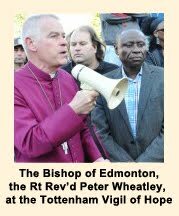 In Edmonton and Stepney under the leadership of Bishop Peter and Bishop Adrian [who has had a challenging start to his ministry in the Area], the church has played a large part in reclaiming the streets for the overwhelming majority of responsible citizens by prayer vigils and public demonstrations of solidarity with other Christians and community groups. "At the same time our network of parish churches - real community hubs - has once again proved its worth. I visited St Mary's Lansdowne Road which has been open fifteen hours a day with volunteers from the parish helping local residents who have lost their homes and serving refreshments to the police and council workers who are clearing up the mess in Tottenham High Street . . ." READ THE BISHOPS COMPLETE LETTER HERE. "The images of violence and destruction on our screens do not represent the strong, hopeful and vibrant communities I know so well. I want to appeal to those responsible for the disturbances to stop.
" . . . Today, as many in our Diocese count the cost of the disturbances, I am deeply saddened to see the images of destruction in familiar places. I will in the days ahead visit those communities that have been at the centre of trouble and I continue to promise my support for, and solidarity with, all who seek to build positive and constructive engagement. 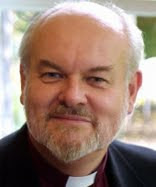 "The Christian message is one of hope, love and peace and I know that the churches of Southwark Diocese stand ready to play their part in bringing healing and hope to the places they serve . . . " READ MORE HERE. Here is maybe the most moving story of all, this time from the Birmingham riots . . . a grieving dad's plea for peace has most likely saved Birmingham from further bloodshed. What a man! Let's pray for all people of goodwill who want to work together for better times.